MUNICH — In every book on time management, there is a chapter about giving your work to someone else. Delegation, they say, is a virtue: an assistant exercises new authority and the delegator accomplishes other tasks, perhaps in other places. Maybe in another country. Or two. 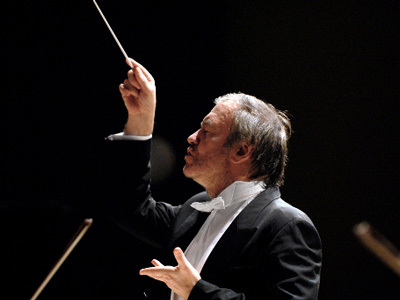 Take Valery Gergiev, incoming Chefdirigent of the Munich Philharmonic. He delegates like a pro, arming répétiteurs and conducting assistants — many of them from St Petersburg’s Mariinsky Theater — with preparatory guidelines to deliver “Gergiev” interpretations on a minimum of Gergiev time. This way, the Russian’s branded, in-person artistry reaches more audiences in more cities. Call it the productization of conducting. Last December, leading up to and including an MPhil program here, Gergiev conducted a choral concert, three operas, and four Stravinsky works, with three different orchestras in three countries, all in one week. It was quite a feat. It was also, inevitably, a week of headaches, as the controlling artist jumped between scores on a near-daily basis. Featured: a postponement, a cancellation, anxious last-minute rehearsing, an opera company’s embarrassment, and, in Munich at least, shallow musical results. The conductor’s devotion to the weightiest project of the week, in Warsaw, offers a clue about how much of what audiences hear in a “Gergiev” performance reflects his work. Teatr Wielki had hired the Moscow-born conductor for a new production of a Tchaikovsky-Bartók double bill premiering on Dec. 13. Directed by Mariusz Treliński, the film noir versions of Iolanta and A kékszakállú herceg vára were a joint venture with the Metropolitan Opera, where they arrive next January under Guess Who’s baton. The assignment came with hurdles, given that the opera company’s orchestra was little accustomed to Gergiev’s ways, the principal singers were mostly new to their roles, the compositional styles of the two pieces were unrelated, and the bill involved the Russian and Hungarian languages in performance by mostly Polish musicians. All this considered, not delegating might have seemed the better part of valor. Indeed, if hearsay is accurate, the week was originally planned at a slightly less frenetic level of activity: just the Warsaw double bill and (on Dec. 18) the Stravinsky pieces in Munich. The parties understood that of the Warsaw rehearsals Gergiev would lead only the final dress, on Dec. 11. Beyond the premiere, the hearsay has it that he was also to conduct the second performance, on Dec. 15, before heading to Munich. For the remaining dates of the brief run, Dec. 17 and 19, the Poles had engaged a second maestro, young Bassem Akiki. The hearsay is credible because the non-updated website of Akiki, as recently as today (April 1, 2014), lists the two dates alone, and, when asked about the original slate for Dec. 15, Teatr Wielki did not deny the suggestion that the Russian conductor was at first scheduled. But Gergiev gave Warsaw much less of himself even than this modest arrangement (Dec. 11, 13 and 15), and in Munich he appeared tired, possibly weakening the Dec. 18 concert. He conducted Teatr Wielki’s Dec. 13 premiere, and he flew to Munich on Dec. 16 to prepare the Stravinsky, only not from Warsaw. “Unexpected circumstances did not allow maestro Gergiev to lead” the final dress rehearsal on Dec. 11, stated Teatr Wielki in an email response to questions (confirming a separate part of the hearsay), and so it was postponed to Dec. 12, when Gergiev was available. Besides distress for the cast, this change, according to the hearsay at least, caused the cancellation of an unrelated concert on Dec. 12. The cast affected was: Tatiana Monogarova as Iolanta, Sergei Skorokhodov as Vodyemon, Mikolaj Zalasiński as Robyert, Alexei Tanovitski as Ryenye, Nadja Michael as Judit, and Gidon Saks as Kékszakállú. “It is absolutely not customary for Teatr Wielki to schedule dress rehearsals one day before a premiere,” wrote the company. Nor did Gergiev conduct the second performance of Treliński’s double bill. That fell to Akiki, even as company managers were trumpeting the participation of the celebrated conductor. Instead he bolted, apparently with permission, for St Petersburg and rapid-switch programs at his own Mariinsky Theater: on Dec. 14 the Verdi Requiem and on Dec. 15 La traviata, both necessarily rehearsed by other hands. It was from the Russian city that he flew here. — How many hours of rehearsal took place for the Dec. 18 Stravinsky program? How many were with Gergiev? Then again, the Munich Philharmonic has a long stake in this conductor (until 2020) and a bigger problem. He has become hot-to-handle due to his support for Vladimir Putin and his seeming confusion of homosexuality with pedophilia. On Dec. 17, amid Stravinsky rehearsals, he was grappling with testy questions at a news conference about these matters. And the Dec. 18 Stravinsky concert? It brought fine musicianship with more than a hint of interpretive emptiness. Being a guest here, Gergiev can get away with such perceptions of disengagement, but he must steel himself for heightened subscriber scrutiny once he takes over. This entry was posted on Tuesday, April 1st, 2014 at 12:52 pm	and is filed under Munich Times. You can follow any responses to this entry through the RSS 2.0 feed. Both comments and pings are currently closed.